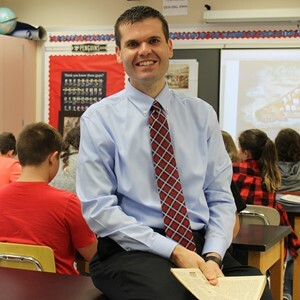 North Hills Middle School educator Joe Welch has been selected as a finalist for 2020 Pennsylvania Teacher of the Year. He is one of 12 finalists from across the commonwealth and the only finalist from Allegheny County. The Pennsylvania Department of Education will announce the 2020 Pennsylvania Teacher of the Year in a special awards ceremony in December. Welch, a Grade 8 social studies teacher, was chosen due to his dedication and commitment to providing his students with the highest quality education and his contributions to public education. He was nominated for the award by fellow middle school teacher Larry Dorenkamp and North Hills parent Carlene Bensch. His selection as a state finalist follows Welch being named National History Teacher of the Year by the Gilder Lehrman Institute of American History earlier this school year. In his classroom, Welch is known for creative and innovative projects that bring American history alive for his students. His philosophy for teaching history, which was included in the application process, is based on students creating stories and publishing content. His students have the opportunity to create animated videos, remix songs to analyze an era of American history, create illustrated children’s books to explain primary sources, intertwine augmented reality to create gallery walks of presidential administrations, all while integrating the resources afforded by North Hills’ Project Connect 1:1 iPad initiative. In addition to this honor, Welch also is an Apple Distinguished Educator (ADE) and lead PBS Digital Innovator for Pennsylvania. As an ADE, he is part of a global community of education leaders recognized their work with Apple technology in and out of the classroom, who advise Apple on integrating technology as well as serving as content creators for Apple. Welch is a recognized presenter who has shared his expertise and knowledge with other educators at various state and national education events. He has presented at the International Society for Technology in Education (ISTE) conference on multiple occasions, the National Council for the Social Studies annual conference and the Association for Middle Level Education national conference in addition to state conferences including the AIU’s Social Studies Symposium and Pennsylvania Educational Technology Expo and Conference.